Under the Pensions Act 2008, every employer in the UK must put certain staff into a pension scheme and contribute towards it. This is called auto enrolment. If you employ at least one person you are an employer and have certain legal duties. It is important that you understand what to do and by when and this will depend on your circumstances and those of your staff. Auto enrolment is mandatory. Competex is offering an auto enrolment module, which will be in addition to our standard payroll processing service, and will assist you in meeting your auto enrolment duties. However, please be aware that the responsibility for compliance with auto enrolment duties lie with the employer and The Pensions Regulator will impose penalties for non compliance. Each employer has been given a staging date, which is the date your automatic enrolment duties come into effect. Please find below a brief overview of your responsibilities. If your company has a number of directors, only one of whom has an employment contract. Please note: If only one director takes salary but more than one director has an employment contract, auto enrolment duties will apply. An employment contract can be either written or implied. An office holder may not be a worker for auto enrolment purposes as they may have no contract or service agreement in relation to their appointment. If they are a non fee earner, they will not usually receive a regular remuneration but may be paid a fee for their office holder duties. Therefore, if there are only office holders on the payroll, and all the office holders, other than the main director, receive non-contractual payments for their appointments, auto enrolment duties will not apply. However, it is important that these office holders are not carrying out any duties that could be considered to be under a contract of employment (either written or implied). If any of your circumstances change in the future you must review your eligibility. If you are eligible you should have received a letter from The Pensions Regulator asking you to nominate a contact. It is essential that you provide them with your details by the date requested. There are many providers offering pension schemes suitable for auto enrolment. We would recommend that you select a pension provider to suit your requirements well in advance of your staging date. If you already have a pension provider, you should contact them and ask them if their scheme can be used for auto enrolment. If your Scheme is eligible and all eligible jobholders (see below for definition) are enrolled and contributions are being made at least to the minimum requirements under AE you do not have to go through the entire process. You simply need to complete the declaration of compliance (see below). If your current scheme cannot be used for auto enrolment you will need to set up an additional scheme which is eligible. We, at Competex, are not qualified to offer advice regarding a suitable pension scheme. If you require assistance in choosing a suitable scheme you should contact an IFA. Please also note that if you will not have any eligible jobholders at your staging date (see below) there is no obligation to set up a pension scheme until a non eligible or entitled jobholder requests to join the pension scheme. However, you must write to these employees detailing their rights towards auto enrolment and complete the declaration of compliance. There are different categories of employees for auto enrolment. Some employees must be automatically enrolled into your chosen scheme at the staging date whilst others may have the right to opt in or join the scheme. This is determined by the age and level of earnings of each employee and an assessment will need to be made each time an employee is paid to determine which category they are in. Please note this amount is less than the personal allowance. These workers must be automatically enrolled and the employer must pay contributions into the scheme for these employees. The employee can also make a contribution to the scheme. There are total minimum contributions which must be made (increasing over time). These workers are not automatically enrolled but have the right to opt in to the pension scheme if they choose. If they do choose to opt in the employer must pay contributions into the scheme for them. These workers must be offered the opportunity to join a workplace pension but the employer is not obliged to make contributions. the worker an eligible jobholder whereas their normal salary would not do so). This allows this spike in earnings not to activate automatic enrolment. 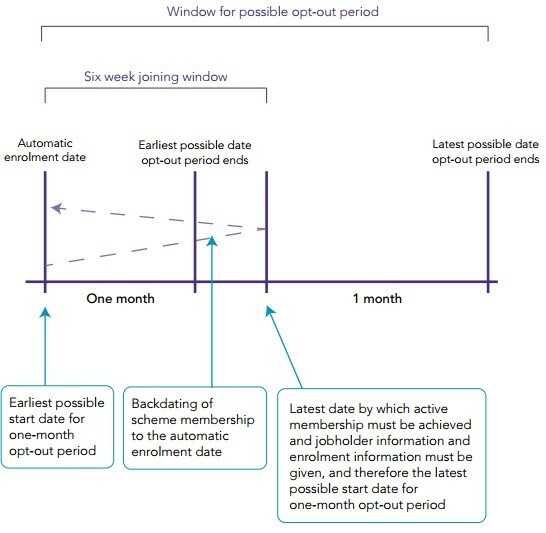 To choose a date which will maximise the amount of time to process opt outs. At the time of postponement, all workers affected must be given a written notice detailing specific information, as set out in the legislation. jobholder on the deferral date, the employer must continue to assess the worker each pay period to identify the next time that the eligible jobholder criteria is met. When this occurs the employer can automatically enrol them or apply another postponement period of up to 3 months. If postponement is chosen, the same process continues. Please note that if the criteria to be an eligible jobholder is met on or before the deferral date i.e. during the postponement period then a further period of postponement cannot be used. If postponement is used for all workers you do not need to set up a pension scheme until you have workers to enrol. Please note that jobholders can opt in/join during the postponement period, at which point a pension scheme would need to be set up. Therefore very careful consideration needs to be given to the amount and timing of salary payments to decide if postponement should be used. Please note: Postponement does NOT postpone your staging date. It only postpones the assessment of your workers. Your chosen pension scheme will have certain criteria but under Auto Enrolment there are minimum contributions that must be paid. The employer may choose to pay the total contribution, but otherwise the employee is obliged to pay their contribution by way of a deduction from salary. Contributions may be paid either on all pay or on qualifying earnings (in 15/16 this is between £5824 and £42385 per annum). Contributions must be deducted on the first occasion the jobholder is paid after the staging date (for eligible jobholders) or the enrolment date (for non eligible jobholders who choose to opt in). information about the pension scheme, contributions, and their right to opt out of the scheme. This must be done no later than 6 weeks after enrolling them. Different letters will be required for each category of worker and also for those who have been postponed (see above). received their enrolment information (known as the opt out period). An opt out notice cannot be submitted prior to the jobholder becoming an active member of the pension scheme. You must not actively encourage your staff to opt out and any decision to opt out must be taken freely without influence from the employer. Please note that all eligible jobholders will need to be automatically enrolled before they can choose to opt out. An employee would usually incur a tax liability if their pension contributions or savings exceed either the annual or lifetime allowance. We strongly recommend that employees in this situation seek advice from an IFA to determine the appropriate course of action. If a jobholder, who has reached or is nearing their lifetime allowance, may lose their enhanced or fixed protection as a result of being automatically enrolled, it is the employer’s discretion whether to automatically enrol them. If contributions have been made into a pension scheme and the worker opts out within the required timeframe the employee will need to be reimbursed for the contributions in the next pay period, and you will need to reclaim both the employee’s and the employer’s contribution from the pension company. Therefore, if possible, you should negotiate a ‘due date’ (the date the contributions have to be paid) with the pension scheme to allow time to process opt out notices and avoid the need to refund contributions. If a refund is due to the employee this must be made by the employer, whether or not they have been refunded by the pension company. Opt out notices must be kept by the employer for 4 years. Within 5 months of your staging date you must confirm to The Pensions Regulator that you have complied with your Auto Enrolment duties. You must complete your declaration of compliance even if you don’t have anyone to enrol. Your declaration of compliance must be completed online via the Government Gateway website and you are liable to be fined if you don’t do it within the statutory timescale. with requests to join and leave the pension scheme. not already enrolled in your pension scheme (because they chose to opt out or cease membership) must be re-enrolled into your pension scheme. Postponement cannot be used for those eligible jobholders who have previously opted out. Auto Enrolment is mandatory and the responsibility for compliance lies with the employer. Competex are offering an Auto Enrolment Module, as an add-on to our payroll service, which will assist you in meeting your obligations. If you would like to use our auto enrolment services please inform us 3 months prior to your staging date. If you do not inform us that you wish to use our Auto Enrolment module we will continue to offer you our standard payroll services as normal. Please be aware that this may mean that you have not met your Auto Enrolment obligations and penalties may be due. Competex is not responsible for ensuring you comply with Auto Enrolment. If Auto Enrolment duties apply to you, Competex is offering an Auto Enrolment service for clients. Read more here.